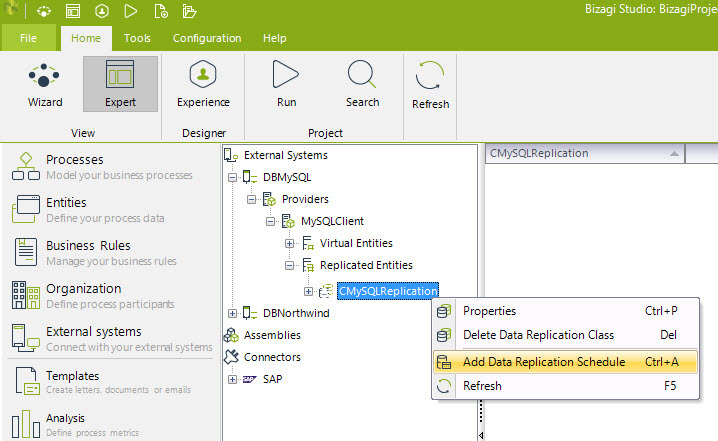 Bizagi provides a Replication Wizard to assist in connecting to an external sources such as SQL Server and Oracle (for data-level integration). 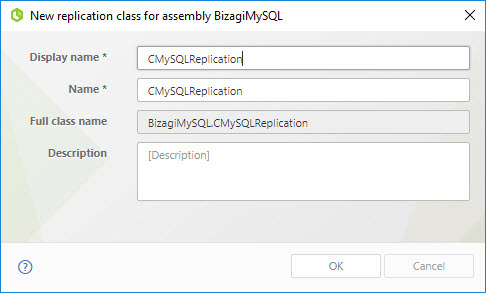 For any data source other then SQL Server and Oracle, there is the possibility to override the methods and classes used by Bizagi in its Replication feature. 1. Creating a custom Replication library. 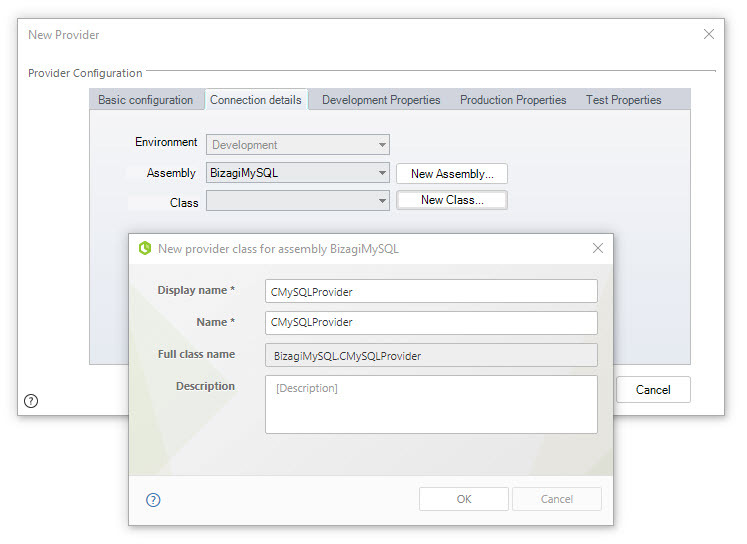 Within this custom library, you will need to override Bizagi Replication's classes and methods (as described in the next section: Classes and methods to override). 2. 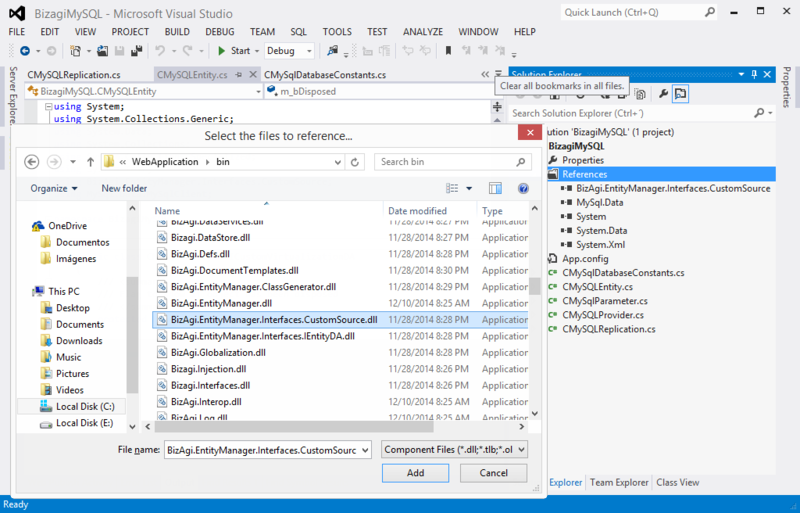 Configuring the data provider in Bizagi to use this custom Replication library. 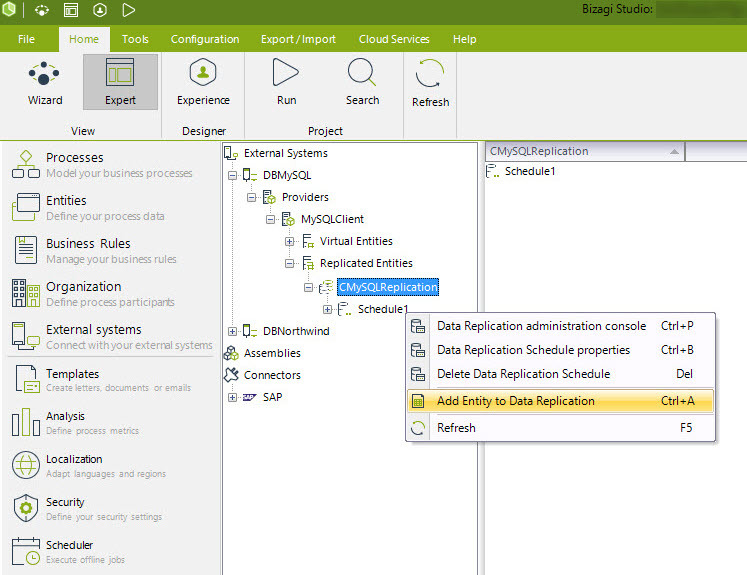 This configuration uses the Advanced Replication configuration in Bizagi. Therefore, when creating a custom Replication library, Bizagi follows best practices for this management and implementation's design. Allows the conversion towards the object that invokes the ICustomProviderDA interface. •DataSet GetEntity(string entitySource, string columnList, string optionalSourceFilter): used to query the values of the external data source. The logic is generally equivalent to making a query on the fields of the data object applying optional filters. Name of the table to replicate in the data source. Array that contains the name of the columns to query in the data source. Contains the where clause to query in the data source. 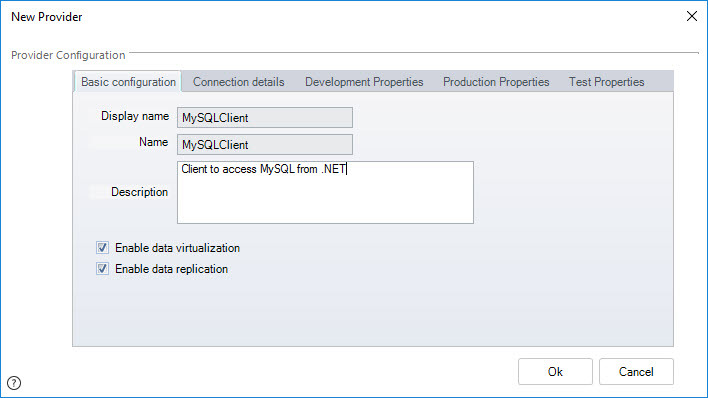 In this example, we will configure custom Replication for a MySQL database engine. We will present an example of the Replication classes that implement the "ICustomProviderDA", "ICustomQueryDA" and "IReplicationEntDA" interfaces. Take into account that the following code provides an illustration for the "GetEntity()" method implementation (to serve as a guide), but other methods are not included and would need further development. 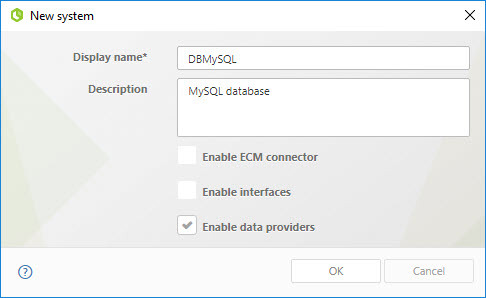 In this specific example, in order to implement Replication classes that connect to a MySQL database, it is required to first download and install the MySQL Connector/NET component for that connection. // You should never close the connection within this method!! In this step, we may configure the System and data provider for Replication; by specifying which library will be used (the custom component we created previously). Take into account that this configuration is done through the Advanced Replication configuration method, which require that the entities to be replicated are already created in Bizagi's data model. 1. Click Systems in the Expert View of Bizagi. Then either right-click the Systems element and select New System from the drop-down menu or click New System in the standard menu bar. 2. 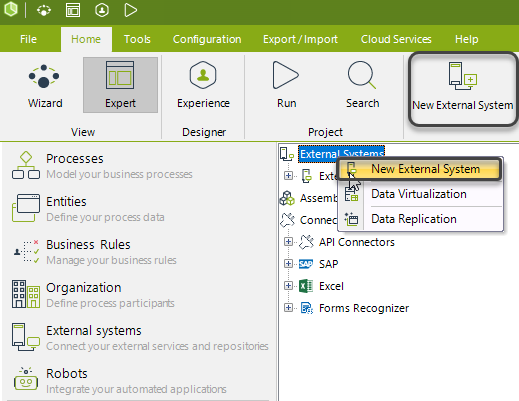 Enter a Name and Description for the new system and click the Enable data providers checkbox. Right-click the New Provider element. 4. 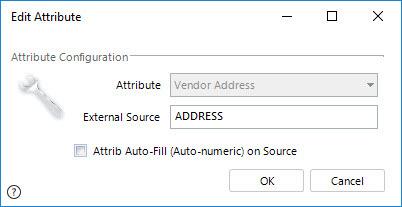 In the New Provider window enter a Name, Display name and Description in the Provider Setup tab. 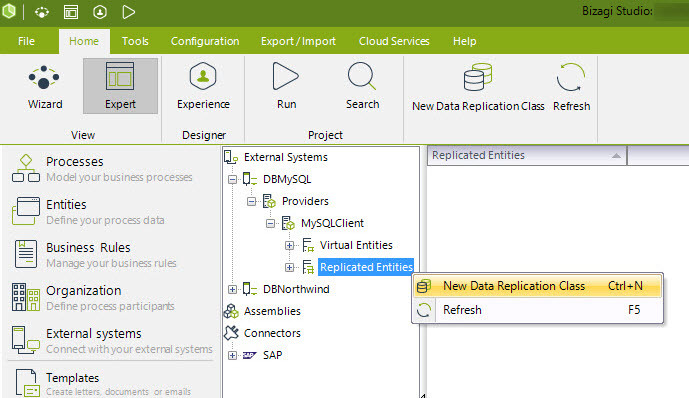 Check the Enable data replication option. Also check Enable data virtualization for this Provider (if it applies). 5. Select the Connection details tab and then click New Assembly. Then click Select Assembly to select the .dll of the custom replication library previously built. Click OK in the New Assembly window. 8. 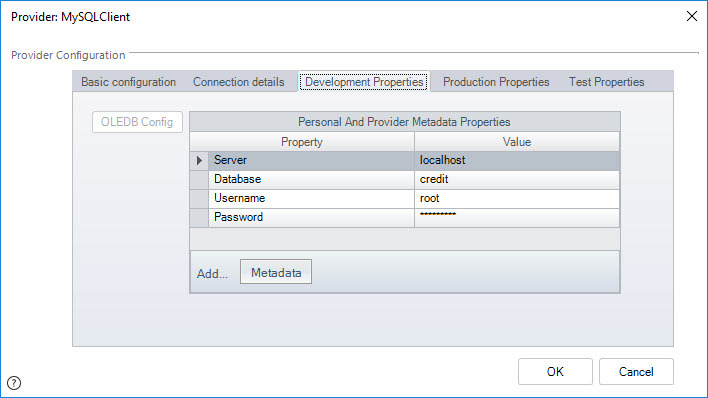 Now in the Provider Development Properties tab, include the connection properties by clicking the Metadata button to create a new Property-Value row. Click OK on the New Provider window. 9. 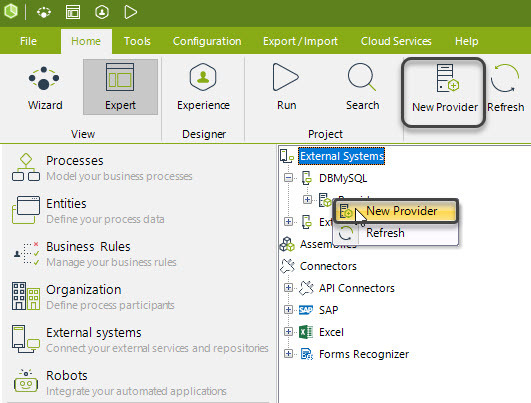 Expand the new provider element, select the Replicated Entities element and create a New Replication Class. Click New Class and complete the necessary fields in the new window. Click OK to complete the Entity Class Configuration. 11. 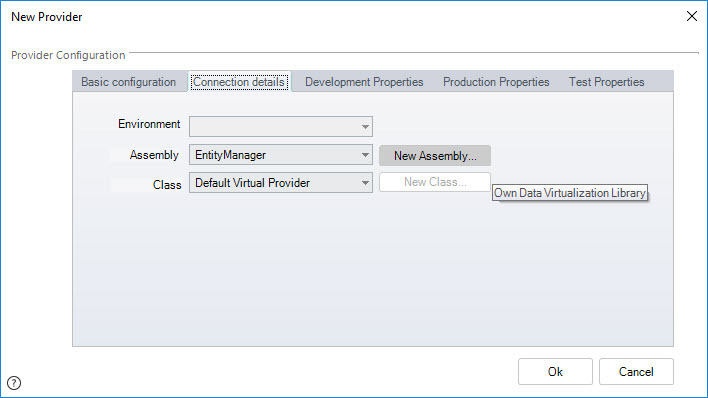 Right-click the new entity class element and select the Add Replication Schedule option. 12. 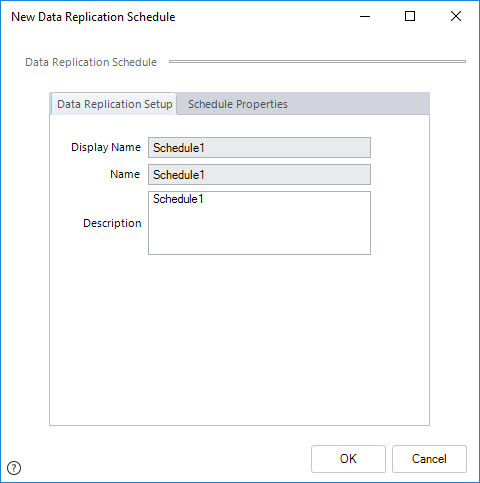 In the Replication setup enter a Name, Display Name and a Description for the replication schedule. Select the Schedule Properties tab and specify the frequency with which the information will be replicated from the data source. Mark Daily, Weekly or Monthly to define how frequently will Bizagi execute the Replication schema. This option will change according to Periodicity's selection. •When Daily is marked: enter the number of days between repetitions of the execution. •When Weekly is marked: enter the number of weeks between repetitions of the execution. Also, select on which weekdays this schema will be executed. •When Monthly is marked: enter the number of months between repetitions of the execution as well. Additionally, select the day of the month in which this schema will be executed. After the configuration is set for the start date of execution, click OK.
13. 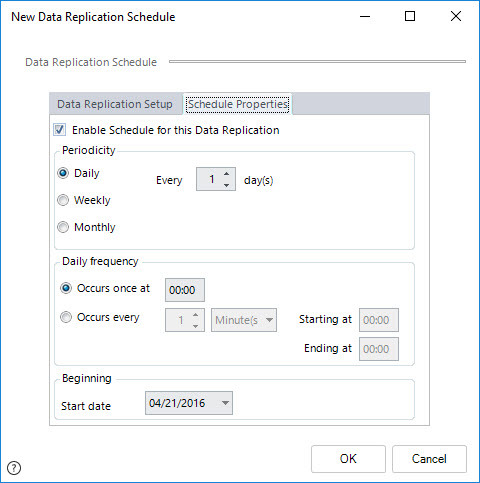 Right-click the schedule and select Add Entity to Replication. 14. 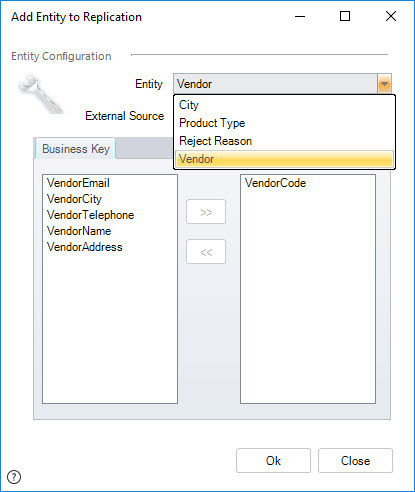 In the Add Entity to Replication window, select the desired entity from the Parameter entities drop-down list. Then, type the external entity name in the External Source field. Next, from the list of attributes of the Bizagi entity, select one (or more) to be the business key (an attribute that has a unique value so that it can be used to differentiate one register form another). 15. Select the replicated entity. Enter the corresponding external column (field) for each attribute of the replicated entity. This is done by right-clicking on the attribute and selecting Properties. In the Edit Attribute window, type down the external column's name and click OK.
Do this for each of the listed attributes in the replicated entity. If your custom Replication library has references to other assemblies, it is necessary to copy them into the Scheduler folder for the Replication's execution. This folder is found by default at: "C:\Bizagi\Projects\[PROJECT_NAME]\Scheduler". At this point we completed the Replication setup using a custom component, to connect to a MySQL database. Once Replication is set, you may choose to verify that its execution synchronizes the values for those Parameter Entities with the external table's columns. 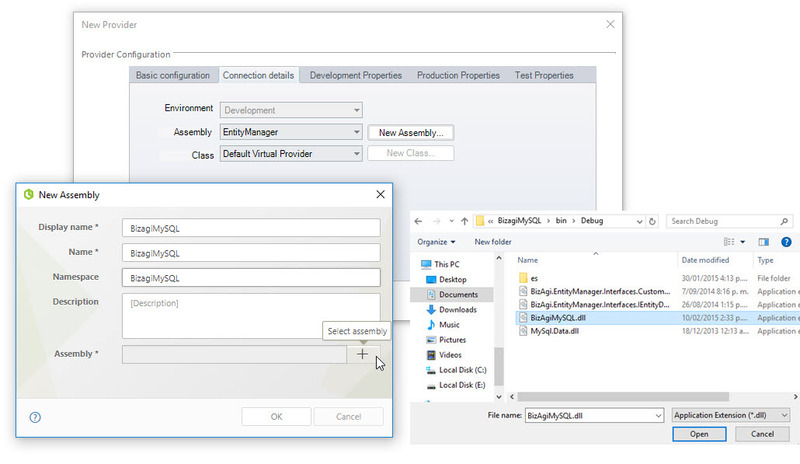 Options displayed in the Systems module are useful for a Production or Test Environment. Options presented in the Entities module will serve as a checkpoint during Replication configuration (in the Development Environment). To view how to verify that the Replication was set up or is running properly, refer to Verifying Replication.